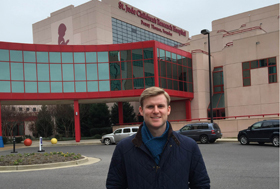 hrough a relatively new fellowship, a University of Mississippi School of Pharmacy graduate student is working at one of the world’s premier pediatric cancer research centers, St. Jude Children’s Research Hospital. Nick Keeling, who is pursuing a doctorate in pharmacy administration, is working under the hospital’s chief patient safety officer, James Hoffman, Pharm.D., and a team in St. Jude’s Department of Pharmaceutical Sciences. Keeling’s work is specifically focused on patient safety and medication outcomes. The Jackson native said that his experience has been extremely gratifying. Donna West-Strum, chair of the Department of Pharmacy Administration, and Hoffman created the Medication Safety and Outcomes Research Fellowship in 2013. In his role, Keeling spends two days a week working at the hospital as a research assistant. His first project involved assessing St. Jude as a high-reliability organization through a survey with hospital leaders. A high-reliability organization focuses on reducing patient harm to none, a practice encouraged by the Joint Commission, a nonprofit organization that accredits and certifies nearly 21,000 health care organizations and programs in the United States. Keeling is working on a project to evaluate hospital safety at St. Jude, which involves administering a survey on patient safety culture to hospital staff in various departments. The research team is analyzing the results, produced by the Agency for Healthcare Research and Quality. Hoffman, who is an investigator for St. Jude’s ongoing study on how to integrate pharmacogenetic information into patient care, said he has enjoyed working with Keeling. Keeling said he knows this experience will prepare him for a future in health systems financing and innovation.